Wineries sometimes offer barrel shares of new wines. This means that you purchase a case of the wine while it is still in the barrel. During the aging process, buyers are invited to taste the wine to experience the changes that the wine makes in the barrel. Last year, as a gift for my husband, I purchased a blended red wine from Forest Edge Winery. Butch Meyer, the winemaker, created a blend of 40% Cabernet Sauvignon, 40% Merlot, 7% Cabernet Franc, 7% Petite Verdot, and 6% Petite Syrah. The wine is called Mes Amis Vin 13. We went over the weekend to bottle the wine. The blend is delicious; a smooth, full-bodied wine with deep red berry flavors. Forest Edge hosted a breakfast followed by the bottling process. We invited close friends as our guests for the day. My husband bottled his case of wine. It is interesting to have the opportunity to bottle your own wine. This event was an especially enjoyable experience. Forest Edge is offering another barrel share for next year with a vintage of Cabernet Sauvignon. 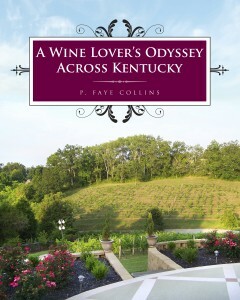 Forest Edge is one of Kentucky’s finest wineries. It is located in Shepherdsville, just about a mile off I-75, at Exit 112, near Bernheim Forest. Wine lovers will find a lot to like, from their reds to one of the best dry Rieslings I’ve ever had. I certainly recommend Forest Edge Winery. 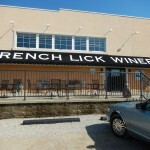 For Kentucky wine lovers looking for a day trip, I recommend French Lick Winery. The winery is located in West Baden, Indiana. Visitors will find it difficult to know if they are in West Baden or French Lick as the towns are side by side. French Lick and West Baden are home to the French Lick Springs Hotel, the West Baden Springs Hotel, and the French Lick Casino. There are also many golf courses, a water park, and a multitude of other activities. But for wine lovers, you can’t beat the French Lick Winery and Vintage Café. The winery is located in an old factory building so the outside is not as impressive as some wineries you might visit, but don’t be misled. When visitors walk through the doors, they will be impressed by the wine tasting bar, the dining area, the glass front winery, and the gift shop. Wine lovers will find themselves impressed, not to mention happy. 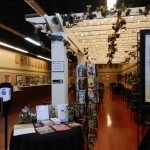 Visitors can start at the tasting bar with a wide variety of wines. Our favorite is the Norton, but their Pinot Gris, Leon Millot, and Traminette are excellent as well. After your tasting, you’ll want to choose a wine and get a table for lunch or dinner. 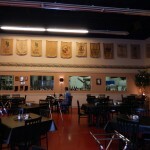 The vintage café offers a full menu of Italian foods. I recommend anything on the menu, but when I’m there, I can’t pass on the pizza. Their pizza is maybe the best I’ve ever tasted. They have marvelous appetizers also. My favorites are the stuffed mushrooms and the All Natural Pan Bigio (a fantastic artisan Italian bread). After your dining experience, I recommend the gift shop. 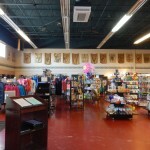 This gift shop offers the widest variety of wine related gifts of any winery around. Shoppers will love it. Whether you visit for the day or choose to stay overnight, French Lick and West Baden, Indiana is a great place to go. March was both a busy and a distracting month for this wine lover. Between illness, weather, classes, and basketball, I’ve been remiss in keeping up. So let’s talk about some wine. My husband and I have had the opportunity to enjoy some great wines, with visits to French Lick Winery in Indiana, Chrisman Mill Winery, and Forest Edge Winery in Kentucky. We’ve also been using Kentucky wines to salute the Kentucky Wildcats victories. This month I’ve been trying a lot of different recipes for the cooking with wine book. Denise Nelson and I have spent some time cooking together. The two of us have some great new ideas for some special dishes. In the next few months, I will be letting you know about the progress. I’m really looking forward to spring and the opportunity to get out and about to visit wineries and try new wines.